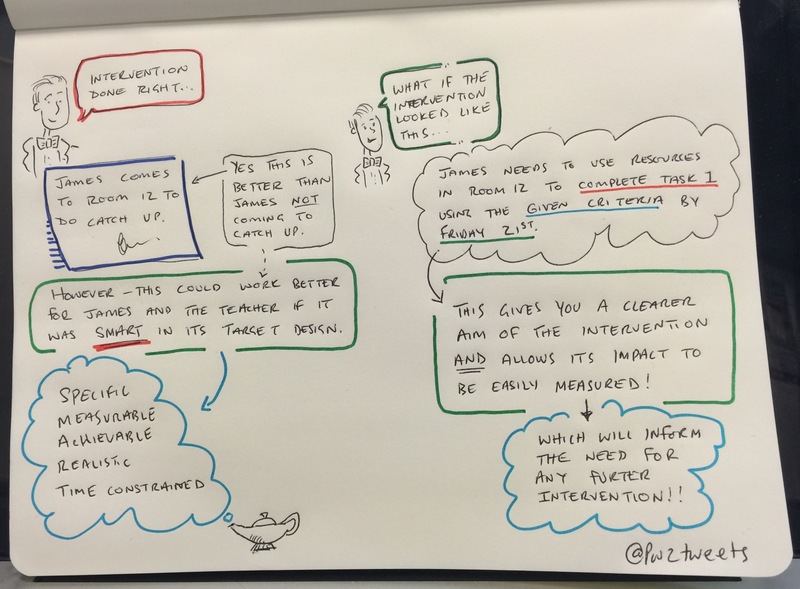 Intervention – a key word in any school especially a school which finds its self requiring improvement. But, as an exercise I took part in this week proves doing intervention and doing it well are two very different things! What was the aim of the intervention? If you don’t know the aim of an intervention you’ve no idea how to measure its success – given that many staff see intervention as something additional to planning you need to make sure what staff are doing is focused enough so that they know when they’re finished and just how successful any intervention has been. It’s not rocket science, in fact it’s one of those moments where when some one says ‘do it this way’ your response is ‘Oh wow, why were we not doing it like that?”. It’s less work, its more focused, you’ll know if what you’re doing is working and you’ll have a clear ‘finish’ date, after all ‘intervention’ should be a short term thing! Targets set should follow the mantra in the diagram above if they’re going to be useful to the learner and the teacher. In or out of class? Ok so you know how to set SMARTer target – when/where do you use interventions? Moving a student seats to complete task 1 by the end of the lesson – focused and measurable! Personalised target to complete drawing with colour by the end of the lesson – focused and measurable! Red/Green sticky notes applied to PC screens of learners based on need to remain in class and finish work on task 1 to leave for break – focused and measurable! Must attend after school classes this week to complete task one design log by Friday the 23rd – Specific and measurable! Evaluate work using criteria sheet in morning catch up club, hand in work Friday 23rd – specific and measurable! Attend Homework club on Monday and Tuesday, read chapter one and write short review using review structure sheet as a guide, bring completed to Wednesdays lesson – Specific and measurable! School improvement: Has everyone got the message?